How has Study Plus helped others? How do I use StudyPlus? How long does a bottle of StudyPlus last? Are you a scholar or a student or just and adult who needs help concentrating? Do you sometimes feel exhausted and burnt out from studying or working? Do you feel you need something which can boost your concentration and your memory, without affecting your health? Do you suffer from nerves prior to a big test or presentation? Do you find yourself studying for hours and then going 'blank' when taking your test? Taking a holistic approach to systemic health will inevitably show in academic success. Staying healthy by exercising regularly, eating healthy meals and nutritious snacks, and getting sufficient sleep are all important factors. In addition to following general studying tips, maintaining health will help maintain the health and vitality of your brain, allowing it to function at peak performance. As part of a holistic approach to studying strategies, natural remedies have been used in traditional medicine for thousands of years to support the healthy functioning of the brain and nervous system, helping to support normal, efficient concentration and focus and maintain a good memory. There are now many published clinical studies demonstrating the ability of a range of herbs to support the normal functioning of the brain and nervous system. StudyPlus is a herbal formula containing 100% pure Gotu Cola in maximum therapeutic dose. It has been especially formulated by a Practicing Clinical Psychologist to boost brain power and improve oxygen flow to the brain, thereby increasing cognitive functioning and leading to better concentration and memory. Regular use of StudyPlus will also help to reduce performance anxiety and exam nerves. StudyPlus contains no stimulants or other products which could induce anxiety symptoms, making it a safe and highly effective supplement for all students and adults from age 12 to 112! StudyPlus is developed with care by our practicing Clinical Psychologist, is 100% natural, safe, and manufactured according to the highest pharmaceutical standards. Individual ingredients are well-researched and have been put to the test over the years as a complement to the treatment of real people with real problems. StudyPlus is recommended for use throughout the year and not just during test taking times (if you are a student). Changes are more subtle but include ability to study and concentrate for longer, better memory and greater ability to persevere confidently at a task. Many students have seen an increase in their grades. "I am 25 years old and I was recently diagnosed with ADD. This diagnoses went undetected for several years. I always knew that I had problems with concentration, but my popular conclusion was "depression". I figured that my depression was the reason why I could'nt concentrate. When the doctors put me on expensive drugs for depression and my ADD it only made me worse due to side effects. The medication is also very addicting. I risked alot trying to rectify this, but the answer was simple. Natural remedies are better. I have been taking StudyPlus for 3 weeks now and I immediately feel a difference in my concentration level. My self esteem is up and so is my confidance. Since ADD is an growing epidemic there is little treatment available to patients, especially if your not classified as a child. This has made me question these medication such as Ritalin and other types as treatment. I cannot correct my ADD but I can enhance my capabilities and StudyPlus has contributed to my success. I am a full time student, mother and wife. There is a lot going on in my world and it is easy to be distracted, but since StudyPlus I get a lot more out of my study sessions. AMAZING! Mother nature is good." "Eric was an 18 year old high school student who came to see me because he was struggling to pass his exams. According to his parents, he worked hard, but just did not seem to achieve the results he expected. When I first saw him, Eric looked like he had all the troubles of the world on his shoulders! He had a handsome face, but his brow was furrowed, his eyes were anxious and his shoulders hunched up. Eric stared at the floor as he told me of his dream to study medicine. As he spoke, he became angry with himself, saying that he couldn't even pass high school - so who was he fooling! During the next week, we did a complete assessment of Eric's intellectual ability and found that the only thing standing in his way was anxiety and poor study habits. With the support of his parents, we helped Eric with a study program and he joined the local gym, where he could work out every day. We also prescribed StudyPlus together with a multi-vitamin tonic. At the end of the academic year, I received a telephone call from an excited Eric. He had just received his final exam results and his marks were good enough to apply to go on to tertiary education! He said that he was much more relaxed about his studies and found it easier to concentrate and remember the work. With the help of StudyPlus, regular exercise and a detailed study program, Eric was able to achieve his dreams!" "Amazing product - I would recommend it for all my students!" 100% pure Centella Asiatica (Gotu Cola) which is found wild in moist areas throughout Africa and Asia. It is used to re-vitalize the brain and nervous system, improve memory and combat ageing. Centella asiatica, promotes mental clarity, enhances memory and brain function and helps to alleviate anxiety. This medicinal herb is so highly respected in Ayurvedic medicine for its effect on the mind, that it is even said to increase knowledge of Brahman - the supreme reality. Recent studies have suggested that Centella asiatica improves cerebral blood flow (CBF) and circulation in general, thereby allowing oxygen rich blood to penetrate deep into the brain. Age 12 – 16. Take one capsule twice daily after meals. Age 16 – 65. Take one to two capsules twice daily after meals. Age 65+. Take one capsule twice daily or as prescribed. For extra support use A+ Test Calmer on the day of the exam or test. Focus ADDult can be used to help with symptoms of adult ADD or ADHD and help with the ability to concentrate. Improvement in concentration and memory should be noticed within 3 - 6 weeks of regular use. Remember that regular exercise, a healthy diet, time to relax and sufficient sleep are essential to prevent burnout during studying periods. Look after your body and it will look after you! 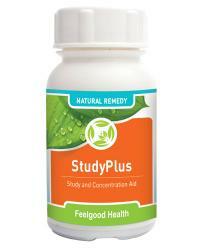 One bottle of StudyPlus will last 15-30 days (depending on dosage of either 1 capsule or two capsules twice daily). For a 45-90 day supply see our buy three get one free special. Adult scholar pack: Focus and concentration remedy with herbal study aid! Guard against test anxiety and retain info while studying!